I’m on a cleanse. A surprisingly stringent clean-eating detox from sugar, caffeine, gluten, and a bunch of other delicious things. Today is day four. Things look grim. Sentences are short. The Why: reconnected with old high-school friend who’s a consultant for the company that makes the detox products, facebook post called for bootcamp recruits, I was feeling pudgy. An email and a phone call later I found myself looking optimistically at thirty days without coffee, bread, sugar, most fruit, and a commitment to eat only organic produce and grass-fed meat. It’s January, after all; the parties season is over and I bore quickly. As noted, I’ve thickened a bit over the holidays and have been feeling rather sludgy. Why not take on a complete lifestyle change I know nothing about? My main concern was having to clean my blender so frequently. Right now my main concern is not emptying the half-gallon bucket of organic almonds I’m cradling like a newborn directly into my mouth with the aid of a shovel and a mallet. My next greatest concern is that I can’t put off my second trip to Trader Joe’s any longer. I am the only person I know who loathes the Trader Joe experience, and would like to sit down with Trader Joe, cousin Trader Giotto, brother-in law Trader Jose and third cousin once removed Trader Ming, and make them justify the layout of their space, which gives the impression that Rodney Dangerfield raced through the store in a naked, meth-induced rage while strewing about the contents of three enormous duffel bags. The produce section’s open floor plan translates into shopping cart traffic chaos, but you’re still safer there than if you’re stuck in bumper to bumper cart traffic within “the grid.” Two and a half actual aisles constructed out of various shelving materials, wood planks, metal woven baskets, wooden barrels and wicker containers aplenty offer the most nerve-wracking, cart-inching, categorically confusing dry goods shopping experience possible. Organic dark-chocolate-covered boysenberries wink ironically at their neighboring bags of quinoa and flax, and an open freezer counter casts a pallid and not at all tempting glow from beneath. I almost lost my handbag, so to speak, when I finally reached the four-foot wide designated rice shelf, and found they were out of brown rice. It’s enough that I’m expected to wash it, I don’t need the main carb of my daily plate (YES, PLATE) to be difficult to obtain. I’ll see you in hell, eventually, Trader Joe, but for now I’ll see you next week. The daily plan involves a shake and some tea for breakfast, then either the same shake or a meal for lunch. Here’s the catch. “Meal” doesn’t mean a nice grilled tomato, bacon and cheese with some Cape Cod chips, or a small spread of muenster cheese, pepperoni, club crackers, pickles and grapes. No, “meal” means that half of the plate’s real estate is flat-out lost to non-starchy vegetables. A quarter of the plate should be a fist-sized portion of lean protein, which gives you an idea of the plate size we’re dealing with from the start. The last quarter of the plate is 2/3 high-fiber carbs and low-glycemic fruits, and 1/3 healthy fats. 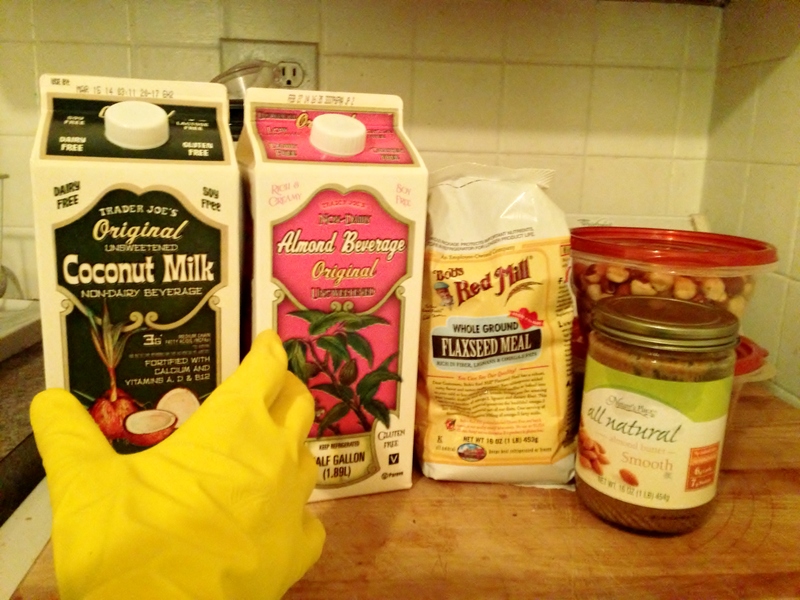 So much fun that I opt for the lunch shake and a bonus handful of almonds. What’s that sound? Pay no attention, it’s just my fury. I can’t seem to overcome a block involving the allowed grains, so I’ve been going full-fruit (rather, full-green apple) on that section. Healthy fats really just means nuts, so I’ve been getting by for the first few days with the following salad, accompanied of course, by my meat fist, as my sole solid meal. Mix the greens together with the salt, pepper, lemon juice and olive oil until all leaves are coated. Add other ingredients and toss. Appreciate that this is only for thirty days, and that this particular lack of enthusiasm is the feeling of getting a little healthier. Enjoy! Aside from my irritability and general snark toward the diet part, I’m keeping with it because I’ve noticed a significant change in my energy-level, and I’ve already lost a pound, not surprisingly. I’m blessed and cursed with an innate one-day-at-a-time outlook, so I’m always aware that tomorrow may find me in my van, parked outside Market Basket, with half a dozen of their store-baked blueberry muffins and a carton of buttermilk. « Wouldn’t you like to go to bed so that Mama can eat out of the pan? Welcome back. Your writing blows my mind.